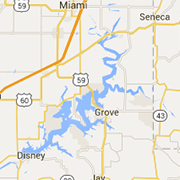 Find a home for your home on wheels with these RV parks and RV resorts in the Grand Lake, Oklahoma area. You'll be minutes away from area attractions and recreation, like hiking, nature trails, golf, shopping, state parks, and of course, the shores of the beautiful Grand Lake o' the Cherokees. For a day, a weekend or the season, find your home away from home at these Grand Lake RV parks.